HES Hartel Tank Terminal is developed at the Maasvlakte in the Port of Rotterdam. The state of the art terminal will offer 1.3 million cbm storage capacity for clean petroleum products (gasoline, diesel, gasoil and jet fuel) and biofuels. It is specifically designed for blending and mixing operations. The terminal will comply with the highest safety and environmental standards and latest regulations. The Maasvlakte is an excellent location for a liquid bulk terminal, offering a VLCC draft terminal with direct access to sea. The quay with length of 1.2 km and draft up to 23.6 m will offer 6 mooring positions for sea-going vessels including VLCC’s. 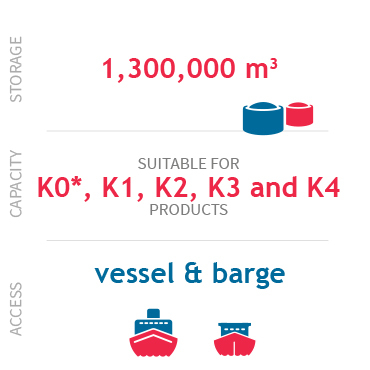 The nine barge positions provide excellent opportunities for shipments to the European hinterland. The location offers opportunities for further expansions. For more information on this project's development, please visit our project website. Besides innovative technology, skilled employees are needed to create a state-of-the-art terminal. Together the best results can be achieved. Would you like to further your career at HES? Please have a look at our career page for newly posted job vacancies. Quay 1200 m, with berths for 3 large vessels or 6 smaller vessels. Our aim is zero incidents. The total design of the terminal and the choices we make are all focused on building the safest terminal possible. In the unlikely event of an incident, we have a sound emergency plan ready and are affiliated with the Gezamenlijke Brandweer ( Cooperative fire department). The state-of-the-art terminal is being constructed according to the latest regulations and guidelines (among which PSG 29) and fulfils the highest environmental and safety standards. Certifications are to be confirmed. The terminal has a state of the art vapour processing plant for minimalizing evaporation of product fumes that could occur during operations. The terminal is also connected to the e-Noses odour network for extra supervision. We choose to use low-noise equipment and electronically controlled pumps can be adjusted to meet customer needs. LED Lighting will further help to reduce the environmentally impact of our operations.